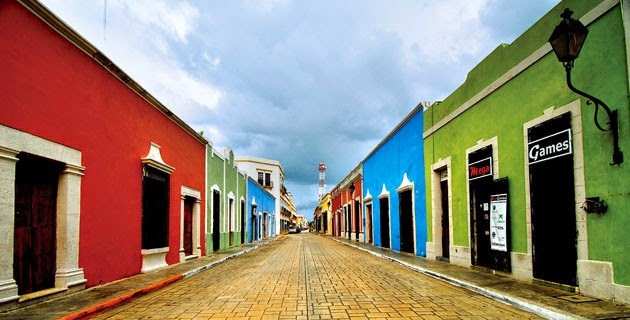 Campeche's main attraction lies in its enormous natural heritage. This is divided into 4 major natural regions: The coast, the mountains, the rivers and jungle. In any of these areas and facilities elements exist to practice different forms of alternative tourism: ecotourism, adventure tourism and rural tourism. UNESCO in 1999; Calakmul Biosphere was also declared a World Heritage Site in 2002. Campeche has 6 protected areas: Calakmul Biosphere, considered the largest tropical reserve in Mexico; Terms Laguna, classified as a natural sanctuary for playing the dolphin, the hawksbill turtle and manatee; Celestum River is the largest area of Mangroves in the Gulf of Mexico; The Petenes are middle islands jungle vegetation that develop between the mangrove; Kin Balam Reserve is a tranquil patchwork of stunning natural landscapes and Ku Balam Reserve, which is a natural biological corridor boundary between the forest areas of north and south, and famous bat sanctuary. The provision of services for these exciting areas of Mexico, ranging from conduct tours through the mangroves across the state in boats or kayaks, to hiking on trails, mountain biking, horseback riding, photo safari, ethnic tourism, archaeological routes, and even craft and cooking workshops. The Caves of X 'Tacumbilxuna' An offer a spectacular light and sound technology which is combined with the natural beauty, mixing images, sounds and sensations. Memorable concerts have been offered multimedia shows and unforgettable. They are Hopelchén City, Campeche. The territory of present Campeche, belongs to one of five cultural areas of Greater Mesoamerica, is witnessed the settlement, development, flowering and decline of the Maya civilization, which now becomes one of the major areas where there are still the ruins of their cities. Is part of the Calakmul Biosphere Reserve. Arriving at the archaeological site the best welcome they give visitors the exotic and beautiful singing toucans and parrots, the fluttering pigeons, wild turkeys. Small mammals such as raccoons, rabbits and armadillos often come to pass, the dominant sound is spectacular howler call that notifies the proximity to the great Mayan buildings protected by vegetation. The pyramids I and II, with its impressive 55 meters high, offering the viewpoint of the landscape, an unforgettable memory of the Reserve. Edzná, for example is located just 45 minutes from San Francisco de Campeche, this pre-Hispanic city will surprise engineering that was built. In Chicanná zoomorphic buildings adorned with the image of the Earth Monster or Itzam, gives way to the Mayan underworld, through its mouth, which serves as the gateway to the sacred rooms. Becan is the city-state that dominated a smaller region. It was surrounded by a moat that protected it from its enemies; buildings, large volumes, have attracted scientific and anthropological interest because of the importance it had in the pre-Hispanic society. Xpuhilm is located in the county seat, one building has three towers that represent viewpoints, the middle image still exhibits a deity looking towards the horizon, waiting for the sunset sun. Balamkú was a Mayan city located almost opposite the junction of road to Calakmul, your visit is slight but essential, the stucco sculpture found in one of the buildings has sized its importance, is a frieze with a rich iconography aroused research interest of art and culture. Terms Lagoon, also known as the "Mesopotamia of Mayab" was declared a protected natural area in 1994 It lead the palisade, El Zapote, Marentes Eastern Chumpan and Candelaria rivers, and with an area of ​​705,000 hectares is part of the country's largest watershed. In addition, in February 2004 he entered RAMSAR list, placing it in the list of unique wetlands in the world vital for the conservation of biodiversity. Located in the municipality of Carmen, Terms Lagoon is an ecological complex consisting of many fragile ecosystems that coexist in harmony. The most abundant is the mangrove; also located here but the high forest and medium forest, flood plain forest, bushes, palm trees, dunes and sea grasses. 1,468 animal species that live and nest in this place are recorded. Besides the largest number of dolphins in the Gulf of Mexico. Species that inhabit and today are in danger of extinction include mojina turtle tepescuintle, peregrine falcon, jaguar, ocelot, Jabiru Stork, King Vulture, boa constrictor and hawksbill turtle. Ecological Conservation Zone "Balam Kin" is a restricted exclusively to scientific research and environmental education area it five of the six species of felines that inhabit Mexican soil and some endemic birds like the blue jay and flycatchers are housed. The walled city of Campeche was declared a World Heritage Site by UNESCO in 1999, thanks to the hard work of restoration done by the state government. The beautiful colonial buildings of the Cathedral of Our Lady of the Immaculate Conception, Ex-Templo de San José, the Mansion Carvajal, the Culture House and the House of Crafts; You are sheltered by beautiful bastions (watchtowers) of San Juan, Santiago, San Miguel, Soledad, San Carlos, Santa Rosa, San Francisco, San Pedro and San José and Puerta de Tierra and Puerta de Mar. The historical attacks that had to fight against hearty European pirates are recreated in a remarkable spectacle to walk from Puerta de Tierra. The Archaeological Museum Hecelchakán, was founded in 1965 and is located in the first frame Hecelchakán city. The Maya Archaeology Museum, is known for its heritage of Mayan stelae and sculpture, located in the heart of the Historic Center of Campeche. At the Museum of Ships and Weapons, completely restored, we can admire an interesting exhibition of ships and weapons of the colonial era, whose military architecture framework Redoubt San Jose el Alto. In the Fort of San Miguel is the Museum of Maya Culture, in the city of Campeche on Av. Scenic.